I never thought I would be saying this, but I am participating for the first time in Tablescape Tuesday! Yes, those of you who know me know that I am a "plates on the wall" kind of gal. However, I have been studying all the beautiful tablescapes that I see every week and I have been inspired. I want to thank all of you for giving me the courage to try this and for being the source for many of my..er..your ideas! I would especially like to thank Susan at Between Naps on the Porch for making this possible and for being our gracious hostess with the mostess! My tablescape has a whimsical country theme with crows, corn and apples. 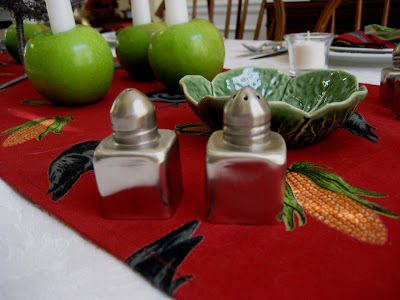 This is the tablescape that I actually used for our Southern-style New Years Day dinner. I don't know why I associate crows with New Years. Maybe it's the dishes I serve...collard greens, black-eyed peas and corn bread....the traditional meal for bringing good luck for the New Year in the South! The crow and corn tablerunner and napkins are central to my theme. I found them at a wonderful little shop in Madison, Georgia, called In High Cotton. The name comes from a Southern expression...if you are "in high cotton" then you are doing well! If you ever get a chance, you should definitely check out this shop! It's chock full of decorating goodies and it's one of my favorites! I wanted to maintain my country theme, so I used Granny Smith apples as candle holders. I used a corer to make the holes for the tapers, then I rubbed a little lemon juice on the exposed flesh of the apple to keep it from turning brown. It actually worked better than I expected! As my centerpiece, I used a crow that I found on the clearance aisle of TJ Maxx for $7.00. That's my little touch of whimsy, as Gollum has taught us. Or maybe it's a big touch. I'm not sure. At first I had planned to paint him black, but when I saw him with my tablescape, I knew he had to stay "as is." He matches my pewter flatware and serving pieces. Besides, I love the way he glows in the candlelight! I put a votive candle at each plate. I really like the effect of the candlelight! The plates are almost shimmering! These are the new plates that I showed you in an earlier post. They are Chardonnay by Oneida. I got a service for 8 for $72 and I have been using them every day and enjoying them. See the grapes around the rim? They remind me of crows, too. Remember the fable of "The Fox and the Crow"? The one about sour grapes? Now, you are probably thinking that everything reminds me of crows! I do love those noisy old birds! You may have been wondering about my napkin rings. I will have to explain. I actually have some beautiful pewter ones that would have been perfect, but I have 4 of them and 6 guests are expected. Then I found something in the kitchen aisle at TJ Maxx and said wooo hooo! These are cookie cutters in the shape of numbers!! For counting down the New Year, right? OK, so maybe I'm stretching it there, but they sort of look like pewter. They make perfect napkin rings! These were only $6 so I grabbed them and ran! I wanted to show you my pewter flatware. Back in the olden days when I got married, it was all the rage to get pewter instead of silver, so I did. These are from Gorham. I love the big chunky handles! They have such wonderful patina and did from day one. You will also notice my Laguiole steak knives. My guests really won't need them, but I wanted you to see them. Remember when Susan did the post about the Orvis ad showing French knife makers sharpening the blades while lying down? Well...these knives are from Jean Dubost Laguiole, a very old French knife company in Theirs, France. You can always spot them because of the bee on the handle. The more traditional style has the horn handles. I chose these to match my pewter. I placed 4 sets of individual salt and pepper shakers around the table. These are not actually pewter, but I thought they were pretty. They came from TJ Maxx also...$10 for the set of 8 shakers. I also love the little lettuce leaf bowl you see behind them. I have one at each end of the table and will put lemons slices in them for the iced tea. The goblets are Godinger Irish crystal that I got on sale at Macy's. I had a coupon, too, so I paid $36 for a set of 12! I'll use the goblets because we will be having sweet tea, of course. I don't know which wine to serve with collard greens!! Do you? I love how the pewter glows in the candlelight! Did you notice that the forks only have 3 tines? That was another reason that I chose them. I think it gives them a really old look. Notice all the little touches of green? I tried to pull out the colors in the tablerunner and the napkins. I used a green antique depression glass butter dish that belonged to my mother. Isn't it beautiful? I love the delicate little designs! I also used this green leaf plate. I know this is a lettuce leaf, ladies! But to this Southern girl, my first thought was collards! I put it beside a collard leaf so you can see why. Now you have to admit that it does look more like collards than lettuce! Anyway, I think it works well with the meal I am serving! I'll put cornbread on this plate. Here's a final look at my whimsical country tablescape. I have to admit that I have a new-found respect for all of you tablescapers. It was hard work! How do you do this every week?? What? What's that you say? A guest? At the end of the table? Ohhhh...it looks as though one of my guests has arrived a little early! I just enjoyed this so much, Debbie--what a gorgeous table. Your crow was a wonderful find, and he looks so elegant with your pewter. I think you cat qualifies as whimsy, too. :-) May this be the start of many wonderful Tablescape Tuesdays! This is so beautiful! Naawww, this can't be your first time.... So, what are you sharing next Tuesday?!? I love it! So many great ideas,the apple candleholders are so creative. I think maybe I am a southern girl and I just never knew it! Thanks for sharing and I am adding you to my blog favs. Cindy in Wi. You go girl! Great first tablescape - I so enjoyed it. Original and fun. Wonderful...well done...loving the apple candle holders. Debbie... love your tablescape... the green is BEAUTIFUL! the apple candle holders... DEVINE! Debbie, This is a beautiful tablescape. I love the granny smith apples as candleholders. And your pewter flatware is to die for!! I love your leaf serving platters. Just perfect!! Oh, Debbie, what a table you've set! I love it! All of the pewter is wonderful as well as your dishes, the apple candle holders the crystal - just all of it! Well to Tablescape Tuesday. You know you can never go back you have to keep setting you table for us! Novice? I beg to differ! You're a pro already! Love the casual/chic flair you're table has going on! And the count-down napkin rings are brilliant! Your table looks simply awesome!!! What a great setting! First of all I love depression glass...pink & green! Love the use of the apples & the cookie cutters...very clever! Your table is gorgeous Debbie! I love all the elements you used, especially the apples & cookie cutters. You are very creative! Beautiful! I love the clean, simpicity of your tablescape. Please give the guest of honor of hug from me, okay? Go check out the award you received from me on my blog! You napkin rings are delightful... counting down the new year or "counting Crows" (a band) anyway... what a fun table. I love it and your butter dish! Well, thank you for sharing one newbie to another! :) This is only my second attempt at Tablescape Tuesday & I can see I have a lot of room for growth. I loved you creativity with the crow, the leaf plates, your Mom's butter dish(the green is much less common than the pink). And you guests is at least not one to complain. Or maybe he is... Have a great Tuesday. And thanks for your visit to my blog too, Debbie! It was my 2nd TT...been doing tables for years, just never did TT till Jain dragged me into it! NOVICE! Seriously, Fabulous table scape. You know I'm loving the green apples, such a great idea.... And the crow theme, just to cute. Love, Love what you did!!!! Just beyond gorgeous!!! Love your Gorham flatware and the crow is so unexpected and precious. What an amazing presentation for TT. Here's to many more from you dear friend. Your "guest" is about the cutest thing ever. LOL! AWWWW! I loved when Carly sang Blackbird!!! Yeah! Nice touch. Love your southern touches, especially using things not in the normal way for something, like the cookie cutters! Wonderful first Tablescape Tuesday contribution, Debbie. I love all the attention to detail. I hope this is the beginning of many Tuesdays with tablescapes, for you! Your table is lovely and I am sure that your guest that night thought so. You have put so many lovely ideas on the table for all of us to share and I love the napkin ring idea. I am having a giveaway so pleas come over and sign up when you have time. Bye the way just when is your next dinner party? I SOOOOOOOO screwed up earlier, so PLEASE forgive me. I passed my award along to you, and even came over to leave you a comment, and apparently got distracted & didn't b/c I don't see it above. Rest assured, I know your name is Debbie (not Donna). When I was trying to link up to people's Html's, I kept editing it because I'd go to there blog after I had them down to give it to them, and they already had the award. I probably moved Donna up & didn't change the name b/c it started w/ a D & I was in a hurry to a hair appointment (priorities)- so, I'm sorry. Please do pick it up. I have corrected my mistake! Now, about that table! I think you've done a fine job, and I like the cookie cutter idea! I love your dishes too! I don't even do a New Year's table, so I'm impressed you did that. P.S. I was so in a tizzie I forgot to tell you that my ABSOLUTE FAVORITE THING was your mom's butter dish (since I collect green vintage glass!) Second place went to those tropical looking (from what I can tell) napkins! I heart them! good afternoon Debbie, Your tablescape is absolutely beautiful! There is so much about it I love. I like using runners on top of a tablecloth. I think it adds color and richness to the table. Yours is so pretty with all the red and the birds. Your candles are so pretty. what a neat idea to use apples as candle holders. I am going to do this. I also like the number cookie cutters. Your plates and glasses are lovely. Everything is just lovely. Debbie, I forgot to add my most favorite part of your tablescape. It was meeting your sweet guest. Hi..thanks for stopping by. Your table is great. 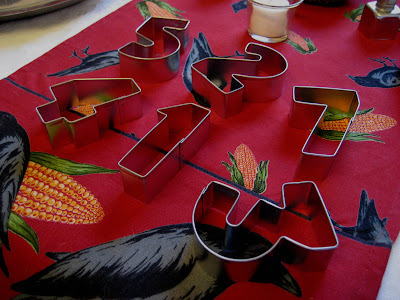 I love the number cookie cutters for napkin rings...great idea. Hope your company had a wonderful time! Debbie, just wanted to say you did a beautiful job of your table. I really like the idea of using apples as candle holders. For a first timer you did great. I love your tablescape, it is super cute!! Everything goes together so well. I also think your guest is really adorable. What a fun table! 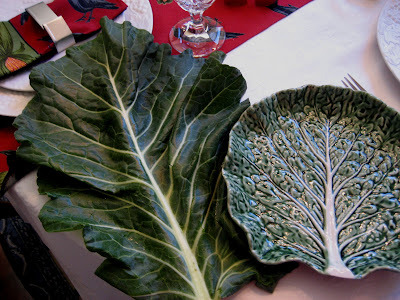 I must admit, I wouldn't know a collard green from any other kind, but your plate is a neat touch. Hi Debbie!!!!!!! HAPPY NEW YEAR!!!!! Your tablescape is fantastic!!!! I luv the crows!!!! You are such a good blogger! So detailed and interesting!!!! Are those lettuce/greens dishes from Portugal? I have a bowl like it!!!! I like chunky flatware as well! I really like the idea of only the three tines! Your fury guest looks way too cute! Sorry I am so late for your dinner. I was trying to find some info for you. I located this on epicurious.com, listed for pairing with collards. You can never go wrong with iced tea, that is commonly referred to as the table wine of the South, as you know. Absolutely adore the runner you used. I love birds, so anything involving them, I find very attractive. I have always shied away from pewter because I thought it was hard to maintain, but yours looks great. Your crow in the table center looks very majestic. I'm also glad you didn't paint him. Love the use of the apples to hold the candles. Everything is beautiful and your guests were very fortunate to dine at such a splendid table. FAN-TAS-TIC! and your guest is gorgoeus! Running behind on visiting everyone's tables...beautiful job! Your very welcome. I, too, think it is strange that someone even thought to pair wine with collards. But then again, in this country we don't eat as many green veggies as they do in other parts of the world. My favorite USE (not pastime) for my computer is finding the answer to a question without a trip to the library being necessary. I didn't read the reviews, however I thought the recipe sounded good. I can't wait to try the Old Bay next time. I love to try something new, keeps life from becoming boring. I think you did a splendid job. I especially like the clever idea using the cookie cutters as napkin rings to usher in the New Year! I have not been to High Cotton in Madison but will on my next trip to the Tour of Homes. i await the next adventure! What a fabulous tablescape...so original, fun and whimsical! Great job! Love those apple candle holders...I did the same thing with red delicious apples for my daughter's winter wedding 8 years ago...they looked great with all the seasonal greens and jars of cranberries with tealights. Very clever using number cookie cutters to countdown to the new year! CLEVER! Love your table. So many great ideas! Oh Debbie What a FABULOUS job you did with your tablescapeing :) I am in such awe of all the stunning tablescapes. I just hope to one day beb able to share with you:) Ironing a linen tablecloth? ReallY? I still have my Mom's linens all perfectly ironed and put away because I just know I will never get them like that again.